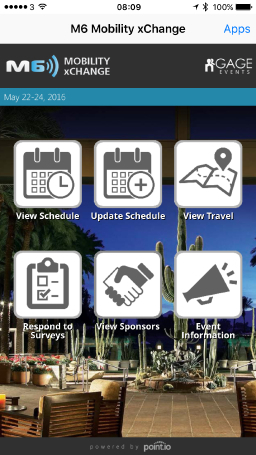 SCOTTSDALE, AZ--(Marketwired - May 26, 2016) - Point.io, a leading provider of Apps for Work, has delivered an App Suite used by hundreds of Mobility executives and sponsors attending M6 Mobility xChange, run by nGage Events. Chaired by Maribel Lopez, M6 Mobility xChange is an invitation-only hosted summit where mobility executive attendees meet vendors and consultants for case studies and one-on-one meetings. Off-the-shelf event apps were not suitable as they were too inflexible for the personalized nature of the event. "We needed a custom event App with additional features our back-end scheduling system could not deliver, such as real-time survey responses and dynamic scheduling changes," said Philip McKay, CEO of nGage. "Point.io delivered in a few days a whole app suite which works on any device with real time updates throughout the event. We eliminated paper feedback forms, which saved us hours of manual work and enhanced our users experience, both attendees and sponsors, by giving them immediate feedback." "Point.io has been demonstrating throughout the event their leadership around robotic process automation in a mobile context," said Kevin Benedict Senior Analyst, the Center for the Future of Work, Cognizant Technology Solutions (NASDAQ: CTSH). "This event App is a demonstration of the speed digital innovation can be achieved in the Enterprise." nGage Events, a leading innovator of hosted-model summits, produces and hosts invitation-only events: upscale business experiences that deliver more takeaway value for attending executives and more ROI for sponsors. As the leading innovator of hosted-model summits, nGage Events hosts exclusive audiences of end-user executives from major and midsize enterprises. Point.io is a fast-growing provider of Custom Apps for Work. The company provides a Cognitive Robotic Process Automation software platform and delivery services to deploy robust Enterprise Right-Time Apps at a fraction of the cost and time. These Apps mobile-enable, extend and enhance mission-dependent business processes and systems. The Apps are as easy to use as Consumer Apps but tailored to each company's way of working, rather than demand users change their processes to suit packaged applications. The company's customers range from Media, Construction, Property Management, Events and Legal. For more information about Point.io, visit www.point.io. Connect with Point.io on Twitter (@point_io), and LinkedIn (www.linkedin.com/company/point-io).